We completed a digital menu board installation a little while back for Alberta Health Services (AHS). AHS is tasked with co-coordinating the delivery of health supports and services across the province of Alberta, Canada. 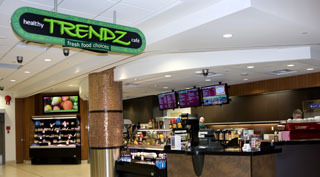 We installed an all-digital menu board in its branded caf� concept, Healthy Trendz, at the Mazankowski Alberta Heart Institute in Edmonton. A portion of the three-screen menu system is dedicated to providing an engaging customer experience by featuring a loop of animated tips, promoting a healthy lifestyle and better eating habits like low-sodium foods and meals containing whole grains. We're seeing a big increase in interest for digital menu boards in the QSR industry. On-the-fly reactions to inventory and promoting featured items in the queue to more unique applications like displaying a live video feed of the kitchen are just some of the benefits restaurant owners are getting�AHS added promoting wellness to that list and we're proud to have taken part in the project. Since that intial installation, AHS have expanded their network to include the food services at the Alberta Children's Hospital and the Cross Cancer Institute. To learn about some of our other Digital Signage projects, visit our clients page. Wrapcity is a quick-serve restaurant specialising in wrap sandwiches and salads. Located in downtown Montreal on de Maisonneuve street, the restaurant offers a trendy setting, healthy to-go foods, gourmet coffees and a happy hour for the young urban professionals that inhabit the area. Wrapcity was looking for a way to positon themselves as an upscale restobar, targetting young professionals and pushing their brand and chic design. They also wanted a way to easily make changes to their new restaurant's menu and push top products. The idea of incorporating digital menu boards into their new location's design came to mind and they called Mirada Media to make it happen. Read the press release on our digital menu board installation at Wrapcity to find out more.